Steve (left) and John McKenzie with a newly decal’d Miller Lite trailer manufactured by Mickey. In the early ‘80s brothers John and Steve McKenzie were running a small screen printing company around Jamestown, NC, and at the same time dabbling in the decal installation business doing work for Hatteras Yachts. Lifelong race car fans, they had the notion they could sell NASCAR on using decals on their cars rather than the traditional sign painting. They started Motorsports Designs in 1982 and went knocking on doors. “At first,” John admits, “It was a tough sell.” But they finally got a shot with Richard Childress Racing and its sponsor – Piedmont Airlines – and from there, as the saying goes, it was off to the races. Today, the McKenzie brothers use that same expertise and passion to perfectly apply graphics on the best truck bodies and trailers in the world – the ones manufactured by Mickey Truck Bodies. It may not be life in the fast lane anymore, but it certainly keeps them busy, and happy. THE MICKEY SPIRIT: How did your work with the Richard Childress Racing Team spark your entry into NASCAR? JOHN McKENZIE: “It was a tough sell getting into NASCAR. It’s still hard to get those guys to try something new. But when they saw the Childress car at the track, they couldn’t believe it; it looked so much better than the painted cars. By the end of the year we had 20 of the top racing teams in NASCAR. TMS: How big did Motorsports Designs become on the NASCAR circuit? JM: We did it all – a complete turnkey operation. We had 8 artists on staff and we were doing Madison Avenue-quality work. In fact, the big ad agencies couldn’t do what we did. We worked for the sponsors – such as Tide and the other really big consumer brands – as well as for the racing teams. Some of the teams had complete control of graphics and gave us the work. The sponsors wanted their brand graphics to look as good on the cars as they did on the packaging, billboards and TV. They had to be exactly right, especially as the sport began attracting massive audiences. There were only 125 companies worldwide that were approved to do Budweiser graphics; we were one of them. TMS: You also introduced NASCAR to the full wrap decal. How did that happen? JM: By 1996 we were already wrapping vans and commercial vehicles, but no one was wrapping race cars – NASCAR was using cut graphics. That year was Darrell Waltrip’s 25th anniversary in racing, and he wanted us to wrap his car in chrome vinyl for Daytona. He liked it so much he had us to it the entire season. It took 4 years to get any real traction on the circuit, but by 2000 it was catching on. In 2002 we did 130 wraps for one multi-car team alone, and just about all of our customers were using full wrap decals. TMS: Is there a big difference between installing the cut decals and the full wraps? JM: The full wrap is much more complicated to apply. There are 11 panels, or components, to a full wrap – the sides, the bumpers, the hood, the roof, etc. And they’re huge pieces. It takes two guys just to apply the sides. We perfected the process. TMS: How did your background in NASCAR graphics lead you to Mickey Truck Bodies? JM: We sold Motorsports Designs in 2006, and I stayed on as a consultant for 2 years before starting our current company, McKenzie Industries. A Mickey employee, who has since retired, was a big race fan and had heard of us, so he brought us in to do Mickey’s OEM decals. From there we started doing the body and trailer decals. 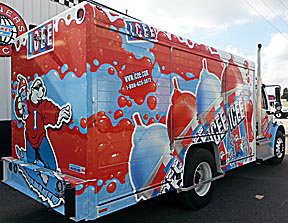 It was great timing because the beverage companies were changing and improving their graphics more frequently, and they wanted perfect rolling billboards. We provided NASCAR-quality. TMS: Is there a difference in applying decals on a race car and a truck body? JM: Whether you’re working on a race car or a truck body, it’s a craft. They have different challenges – on a race car there are not many flat surfaces, and on a body you have all the slats in a roll-up door. When I started doing the Mickey work, I brought in Jason Ingram to train our installers. Jason works for the Richard Childress Racing team and is probably the best decal installer in the business. He does immaculate work. There’s a craft to decaling and our guys have learned that craft. I put the guys doing the Mickey units up against anybody. TMS: Do the decal installers work for McKenzie Industries or Mickey Truck Bodies? JM: Our installers are all independent contractors, and there’s a reason for that. Installing decals is all they do – they have no other job responsibilities – and they do it to perfection. We provide a place for them to work and plenty of quality work. They come in with their own tools and they can work the hours they want – nights, weekends. It enables us to keep a core group of 10 to 12 highly professional installers. Six of them rely on us virtually full time for their employment, and another six are available on demand. These guys come in to apply decals – they don’t let a desk grow under their seats. TMS: Has the beverage industry embraced the concept of full wrap decals like NASCAR did? JM: We just did full wraps on 40 ICEE bodies for Mickey — the most vinyl ever put on a Mickey body. We covered every inch of the trucks – cabs, fenders, doors, rub rails, headers. We actually wrapped the rear bumper – which was a first for us and probably the first for anybody. But in general, you won’t see a lot of full wraps in the beverage industry in the near future. The compound curves are difficult to work with. And after 2 or 3 years they won’t look as good with all the wear and tear – especially on the roll-up doors from all the opening and closing. You have to remember that the race cars get new decals every Monday morning after a race. TMS: Are all decal materials created equal? JM: We’ve run into many scenarios where companies try to save money on graphics by using inferior materials, but rarely on a Mickey unit. These companies know they are buying the best bodies and trailers in the business, so they want to supply the best possible graphics. The graphics suppliers seem to go all out for Mickey. They do not take Mickey’s history, quality and expertise lightly. 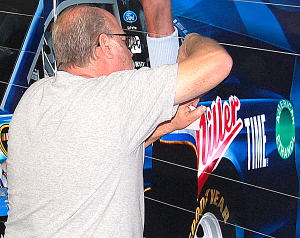 I think it also helps when they see that these decals are being installed by NASCAR –trained professionals for a company that at one point was doing the graphics for 20 of the top NASCAR racing teams. I guess that just inspires excellence throughout the process. Installers are NASCAR-trained. “I put the guys doing the Mickey units up against anybody,” says John McKenzie. TMS: What role does Mickey play in the actual process? JM: Mickey salespeople have a tremendous liaison with both the beverage companies and the decal manufacturers, so before the job gets to the final approval stage, everybody knows what’s going to fit or not fit. It’s difficult when the decal makers design the graphics based on the brand specs alone, without knowing anything about the body or trailer. That’s not the case with a Mickey unit. TMS: What does McKenzie Industries do to make sure everyone is singing from the same hymn book? JM: We’re taking a much more proactive approach in getting the layouts ahead of time so that we can study them and be ready to apply the graphics as soon as the trucks arrive. It makes for a higher quality, more efficient and usually faster installation. The Mickey sales people have been wonderful to work with to get us the layouts so that we know what’s coming down the pike and can be better prepared. We also work closely with the company that actually produces the graphics. We want to make sure everything fits. TMS: What’s the next big innovation on the horizon for decal applications? JM: The biggest thing now is the egress technology. All the premium decal manufacturers – 3M, Avery, Oracal – are using egress adhesive systems. The liner of the decal is embossed so that when it’s wound up tight in manufacturing it will make an impression in the adhesive, which allows the air to exit. That helps eliminate bubbles and wrinkles. It make our work a lot easier. TMS: So the egress technology is here. What’s next? JM: I think the next thing is to improve the decal removability. Some vinyls go on and come off like post-it notes. And I think that’s where they are all headed – to be able to be taken off as fast as they are put on without leaving any residue. That would make perfect sense since these big branded companies are changing their graphics so frequently these days. We developed some of that technology in the racing industry because their graphics have to come off first thing every Monday morning after a race. Removability is the biggest thing in racing and I think it’s going to be the same way in the truck body and trailer business.